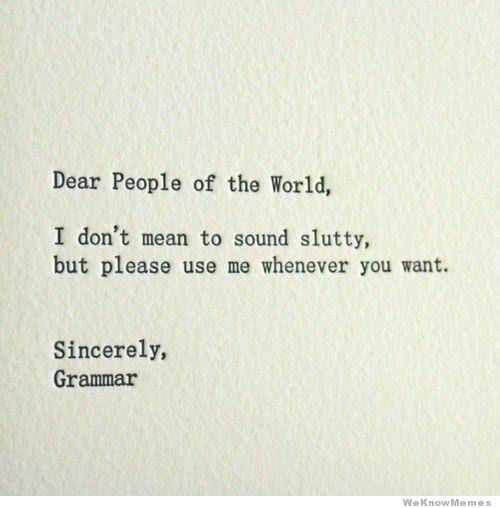 I am kind of person who apparently often act myself as a grammar police in certain situation. I admit that I also speak or write grammatically incorrect many times, even much more often that when I act as the grammar police. But now I know why that kind of awareness appears on me. First because I have learned about the grammar which I corrected, and the second is the reason that yesterday I got from the explanation of my lecturer. It is said that “A language has a set of rules that define how morphemes can be joined together to form a rule”. Don’t be too soon confused with the term ‘morpheme’ there. Morpheme is the smallest meaningful units in a language, such as ride, fair, un, dis, and etc. Morpheme is not the same with word, because there are some morphemes which can’t stand by themselves. For example: rides. Well now we’re back to the statement “A language has a set of rules that define how morphemes can be joined together to form a rule”. So here, when we use the wrong form of language, for example we write: “DINI’S BELONG”, or “SHE IS DRIVES THE CAR BY HERSELF”, it means we are not following the rule and it can’t be acceptable by the native speakers since they don’t have that kind of system in their language. The correct form of the first example is “BELONGS TO DINI” (for example we write it in our book), while the second one can be “SHE DRIVES THE CAR BY HERSELF” or “SHE IS DRIVING THE CAR BY HERSELF”. That’s why when we use the incorrect form of language, instead of using English language, we actually JUST BORROW some English words to be put to so-called our own system/rule.